□ Phys.org online science news website has written a feature article on the research being performed at the Gwangju Institute of Science and Technology (GIST) by Professor Kwanghee Lee of the School of Materials Science and Engineering. ∘ On January 13, 2017, the UK science and technology magazine, Phys.org, wrote a feature article on "a new 2D semiconducting polymer-blended nanonetwork material" developed by Professor Kwanghee Lee whose research team found a sweet spot for organic electronic devices. 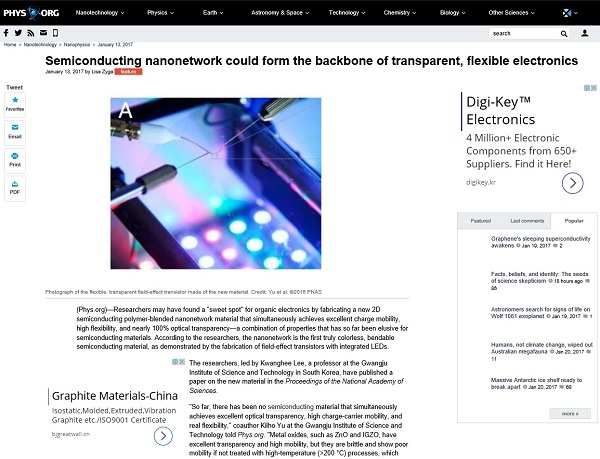 □ Professor Kwanghee Lee (correspondent author), Dr. Kilho Yu (first author), and Dr. Byoungwook Park (joint first author) have developed an organic semiconductor with a net structure with nearly 100% transparency. Their paper was published in the Proceedings of the National Academy of Science (PNAS). This semiconductor / insulator polymer mixed network semiconductor has a charge mobility four times higher than that of a pure thin film type, and it has a visible light transmittance close to 100% due to a structural characteristic such as a very thin mesh. You can see objects on the opposite without any color distortion. ∘ The results of this research have attracted attention as a technology that will allow for the realization of electronic devices that are freely flexible (as seen in science fiction movies), and the news has been reported more than 20 by domestic media outlets. □ Phys.org is a popular online medium covering science and technology in general. It has 1.75 million subscribers, including scientists, researchers, and engineers from around the world. It reports about 100 major scientific and technological news every day. It covers important new breakthroughs in science and technology. ∘ Professor Kwanghee Lee"s team has been attracting a great deal of attention since their Phys.org article has been shared over 800 time on social networking sites.